Kendall Boney connected with Jadon Haselwood on a first quarter touchdown pass for the early 7-0 lead and never looked back. Chavon Wright had a pair of touchdown runs and Oral Ashe, who had six PATs in the game, hit a 30-yard field goal as Cedar Grove went up 24-0 at the half. Wright added a 46-yard touchdown run in the third quarter and Austin Smith threw passes to Rashad Jordan and Montre Montfort for touchdowns to wrap up the scoring. 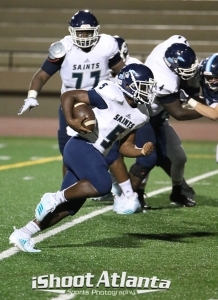 The Saints improved to 4-1 overall and 1-0 in Region 5-3A as they began their defense of the 2017 region title. Lovett fell to 1-4 overall and 0-1 in the region. Cedar Grove moves on to take on Redan (0-5, 0-1), a 35-14 loser to Pace Academy (3-2, 1-0) on the road on Friday, in a game set for 5:15 pm at Godfrey Stadium on Friday. Redan jumped out to a 7-0 lead on Pace as Dennis Roberson took a lateral and then connected with Deljuan Mitchell for an 80-yard touchdown pass. Pace roared back with 35 consecutive points on the way to the 35-14 win. Towers (0-5, 0-1) fell behind Westminster 28-0 at the half before falling 35-14 in Region 5-3A play. The Tucker Tigers improved to 3-0 in Region 4-6A play with a 42-12 road victory over Drew (1-4) at Southern Crescent Stadium. The Tigers are now 3-2 overall. Martin Luther King (1-3, 0-1) fell 35-12 to Mundy’s Mill (4-2) in Region 4-6A action at Twelve Oaks Stadium. Dunwoody (1-4, 0-3) dropped its third consecutive Region 7-6A tussle 55-21 to region leader Alpharetta on Friday night at North DeKalb Stadium. The Wildcats threw three touchdown passes in the game two by Drew Koehler who was 3-4 passing for 101 yards in the game and one by Davis Ledoyen. Tyler Eith (37 yards), Luke Pankey (47 yards) and Dustin Gaultney (37 yards) were recipients of the scoring tosses.